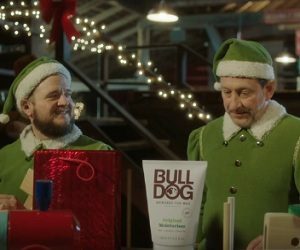 Bulldog Skincare has released a funny Christmas advert, with two awkward elves in the main roles. The 60-second spot features Santa’s little helpers building toys and having, in the same time, a conversation in the wake of Christmas. “Isn’t Christmas great?”, asks one of them to the other. “Sure it is. I just love Christmas”, answers his co-worker. The look on his interlocutor’s face suddenly changes, as he is left speechless. “So… I got you something”, continues the first elf, who places then on the table in front of them a red shining gift bag from which he takes out a Bulldog moisturizer. “Moisturizer”, explains the elf. “For men. Yeah. Contains aloe vera, camellia oil, green tea. It will leave your skin feeling hydrated”, he adds, leaving his co-worker speechless once again. After an awkward moment of silence, the latter changes the subject: “So…these toys won’t make themselves, huh?!”. This time, it is the elf with the gift idea that remains speechless and quite disappointed that his initiative did not have the desired impact. The spot ends with the onscreen line “The perfect gift for any man”.